London - After the Premier League this season have the second half, Leicester City remained on top, even now stick to the top. Even so, The Foxes were asked to remain calm. Leicester won in Week 21. They beat Tottenham Hotspur 1-0 at White Hart Lane on Thursday (14/01/2016) pm dawn. The lone goal for the visitors scored by Robert Huth through a header in the 83rd minute. 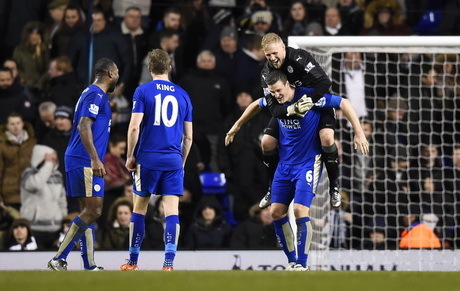 Leicester did not get the victory easily. Spurs kept pounding them and had good opportunities through Dele Alli, Christian Eriksen, Erik Lamela, and Harry Kane. Spurs best chance to come by Kane in the second half. Kane who got the breakthrough pass from Lamela directly facing the goalkeeper Kasper Schmeichel, but Kane could be anticipated flick the ball Schmeichel and then just hit the crossbar. "A fantastic victory over a great team," said Leicester manager, Claudio Ranieri, as quoted by Reuters. "At first it was difficult because Tottenham started the match very well. However, we maintain our composure and form of the game. Slowly we are getting better and created some good chances to score," added Ranieri. "The second half was an open game. We created a few chances, they created some chances, and we won. We are very happy," he said. Thanks to the victory over the Spurs, Leicester now clung standings leader, Arsenal. The two teams both have 43 points, but Arsenal on goal difference. "Unfortunately, this is new in January, May Not. There is still much work to be done," said Ranieri. 0 Response to "Only calm, Leicester"